I can admit it now that I’m old and don’t need to think about my CV: I never really got on with a 9-5 desk job. That February day, standing next to my Line Manager’s desk, was an example of why. I had applied for some time off for a big holiday. Given that I was contracting (so not getting paid leave) and the holiday would have been beyond the end of my contract, it should have been a formality. But this guy thought that the definition of management is making it tough for your staff, so he was always going to say ‘no’. ‘You can have two weeks, no more.’ He said. I had asked for four, willing to settle for three. I thought about it, standing there: big decision. I was getting older; my family was getting older. If not now, when? ‘No problem...’ I said. He smiled. ‘It’s beyond the end of my contract.’ I added. He frowned. Three months later I was out of a job and travelling across America, coast to coast, New York to San Franscisco. Much of the trip was devoted to just seeing America and hiking and camping some of the National Parks. We hiked on the Appalachian Trail in New England; we camped in the wilderness of Yellowstone canyon with only hot springs for company; we camped on a sand bar in a river beneath the tallest trees on Earth; we walked for three days on the John Muir trail from Yosemite to Mammoth Lakes; we dodged tornados and a terrifying storm in the Dakota Badlands. In short, most of the trip had nothing to with astronomy. But I couldn’t cross the USA and not visit a few of the astro-sights I had wanted to see since childhood. 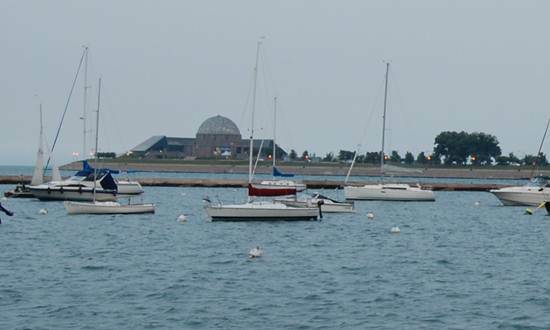 One of the most obvious was Chicago’s famous and venerable Adler planetarium. We woke-up in a shabby motel in the Chicago suburb of Gary, following a late arrival tired from a day rubbernecking at Amish buggies in Indiana. There had been an ugly incident in the motel that night when some guy in a v8-rumbling pickup had cruised in and then started knocking on doors looking for his wife. When he found her there was a lot of shouting and scuffling that had us cowering in our room wondering how many EconoLodge breeze blocks it takes to stop a bullet. So that morning we got out of Gary as quickly as we could, never mind the traffic. ‘Join the motorway, then keep LEFT…’ said the SatNav. I joined the motorway, then looked in despair at ten lanes of bumper-crawling trucks and cars between me and ‘left’. So we were all pretty wound up by the time I finally made it to the lakefront and the Adler Planetarium. By the time we had walked the short distance from the car park to the entrance, past Henry Moore’s statue of “Man Meets the Cosmos”, we were soaked from the rain and gales lashing across from Lake Michigan. I noticed a little thing that seemed weird to an Englishman: though the harbour and the choppy grey, horizonless water looked like the sea, the rain and wind didn’t smell of the sea. The Adler Planetarium is one of the oldest in the USA and possibly the World, having been founded in the thirties. It is a National Historic Landmark, but nowadays a modern glass museum wing enwraps the old dome. 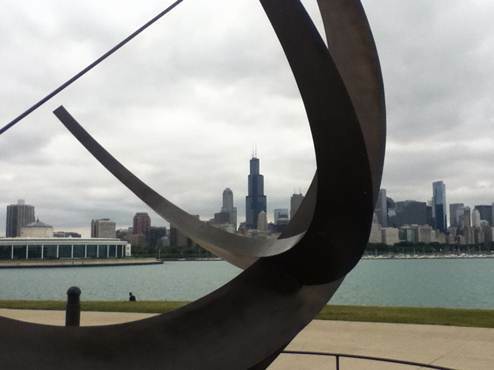 ‘Man Meets The Cosmos’ – Henry Moore outside the Adler with Chicago’s skyline beyond. The rain continued gusting off the lake all morning and we amused ourselves mooching around interpretative displays about astrophysics (science discipline, not scope maker) and some really big meteorites, mock-ups of the Mars Rovers and other interesting space stuff, but two things really grabbed my attention. The first was the Mars simulator. Now I am not much for video games and if I had been perhaps the simulator wouldn’t have seemed so remarkable; as it was I behaved like a kid and spent much too much time on it whilst real kids queued and moaned (sorry). A small darkened room, three big screens like the windows from a spaceship and a joystick made up the display. As you moved the joystick, the surface of Mars flew past the windows and you could descend to skim the surface or go way out into orbit. It was great fun flying around and trying to seek out landmarks I knew, like Vallis Marineris and Olympus Mons. If I were, say, Billionaire Bill, I’d have one of these at home. Yet another display about supernovae leaves me a bit jaded, but I have to say that the many such displays at Adler were world class and would be a very useful teaching resource. Perhaps that’s why the Adler was heaving with schoolchildren that day, disgorged from rows of yellow buses at the entrance (no rainy walk for them). 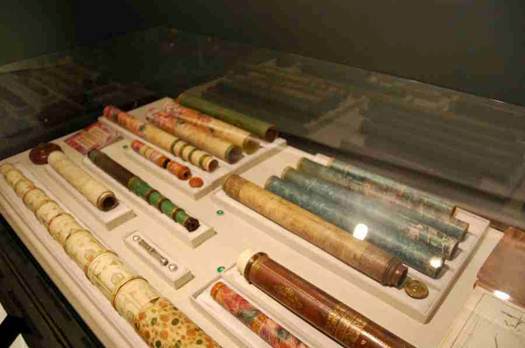 The second exhibit at Adler that caught my interest was the display of old telescopes, starting with a loaned display of Galileo’s first instruments from the Museum of the History of Science in Florence (one of my favourite museums, by the way – want to see Galileo’s actual withered finger ?) and continuing with various gorgeous historic instruments. My favourite was (you guessed it) a big old refractor, built by Alvan Clark in 1864, that had once been the largest refractor in the world. 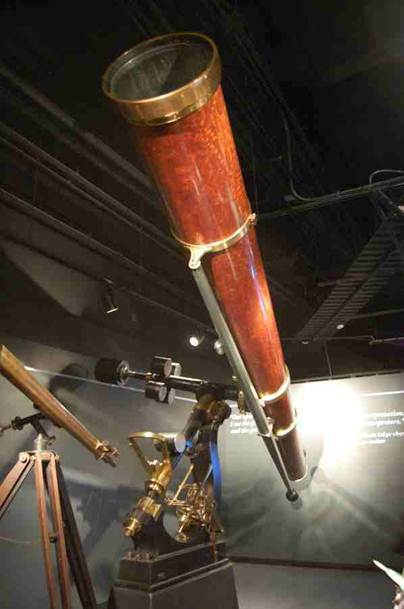 The “Dearborn Telescope”, as it is known, has an 18.6” lens, a beautiful walnut tube, weights like balls from a spark machine and an almost sculptural mount with brass clockwork. Alvan Clark later went on to build other large refractors, including the all-time record holder at Yerkes. The historic instruments section had loads of other interesting exhibits, from a mock-up of a Galileo-era classroom, to a tutorial on how to use an astrolabe. We took refuge from the crowds in a small side exhibition, a very personal one called “Shoot for The Moon: A Journey with Jim Lovell”. Lovell is of course the Apollo astronaut most famous never to walk on the surface of the Moon. 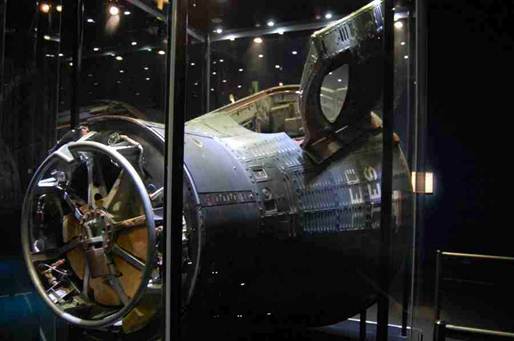 There was, perhaps predictably, Lovell’s Gemini capsule (talk about ‘sitting in a tin can’ – a tight space for two) and one of his space suits; but I liked the trivia best, especially Lovell’s letters to and from the astronaut office. I am writing to advise you of the outcome of the Project Mercury Pilot Selection Program in which you have been participating. 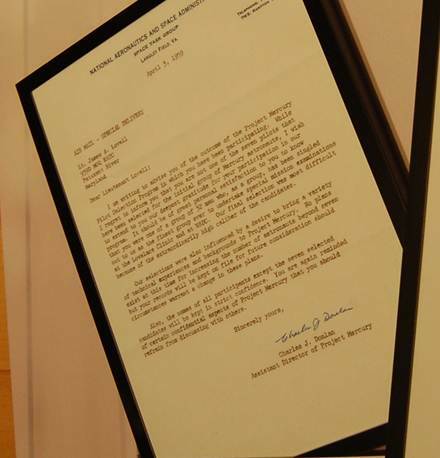 While I regret to inform you that you are not one of the seven pilots that have been selected for the initial group of Mercury astronauts, I wish to extend to you our deepest personal gratitude... [blah blah blah]. Downstairs in the basement of the Adler is a series of classrooms and lecture rooms in which there is always some kind of interpretative activity going on; you can just drop in and listen. I found myself in a talk from a member of staff who had just returned from the Bay of Fundy with some video footage in 3D. What has that to do with astronomy? Well you may recall (another Guiness fact) that Fundy has the biggest tides of anywhere in the world. The tidal range at Fundy is regularly over fifty feet and has been as much as 70. The vertiginous 3D view over the edge of a quay with the tide out really was extraordinary; I must go there some day. We ended up spending the whole day at Adler and I can highly recommend it if you’re in Chicago, it’s a great day out with lots to interest both adults and children. If it’s a nice day, walk down there from your downtown hotel and enjoy the waterfront parks and other museums on the way. Of course Chicago has lots else to offer and is one of the World’s great cities. Other highlights for me included the start of Route 66, skyscrapers including the Monadnock Building and Sears Tower and the Chicago Art Institute – a really first rate art museum. A half day’s drive north of Chicago is another must-visit astro-destination (and no, I don’t mean Astro Physics in Machesney Park) – The Yerkes Observatory – but that will have to wait for another article.